Wait?! Isn’t that what everyone tells you to do? Why, yes, it is, and the point of telling you to pull your shoulder back is so that they don’t slump (or get pulled) forward. But your shoulders shouldn’t be held rigidly in position either, blocking the flow of energy up and down your back, making it harder for your horse to move freely through his back. Your shoulders should widen, away from your center, creating maximum space and resilience in your torso, for breath, for strength, for liveliness. Look at the diagram below. 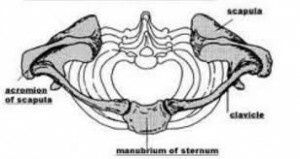 It is the shoulder girdle from above, looking down at the spine (at top of diagram) and sternum (at bottom of diagram) and the shoulder blades and collar bones floating on the ribs. You can see that if you pull your shoulder blades together, it narrows your torso. If you drop your collar bones forward, that also narrows your torso. For the torso to be open and strong, both the collar bones and the shoulder blades must widen away from the center. This creates more fullness and less compression in your back, which makes it easier for your horse to move with suppleness and coordination. Try this on your horse and let me know how it feels!